Conor McGregor and Khabib Nurmagomedov's purses for their upcoming showdown have been revealed. McGregor will bid to end Nurmagomedov's reign as lightweight champion in the main event of UFC 229, which takes place at Las Vegas' T‑Mobile Arena. 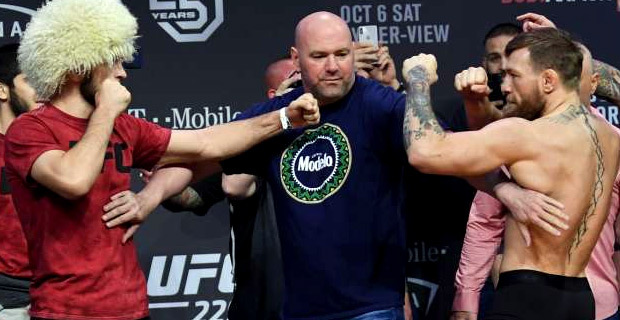 The pair's showdown has been billed as 'the biggest fight in MMA history'. The UFC are expecting their latest pay‑per‑view show to be purchased by nearly two million fight fans. The Nevada State Athletic Commission revealed that McGregor will make a guaranteed $US3million for his comeback. Nurmagomedov, meanwhile, will pocket $2 million for his maiden UFC title defence. It's worth noting that the figures disclosed by the NSAC don't factor in the fighter's cuts of the pay‑per‑view pie, which will drastically increase their respective paydays. The fight will be at 4:30pm.